The Tech Report published an update on HDD pricing. 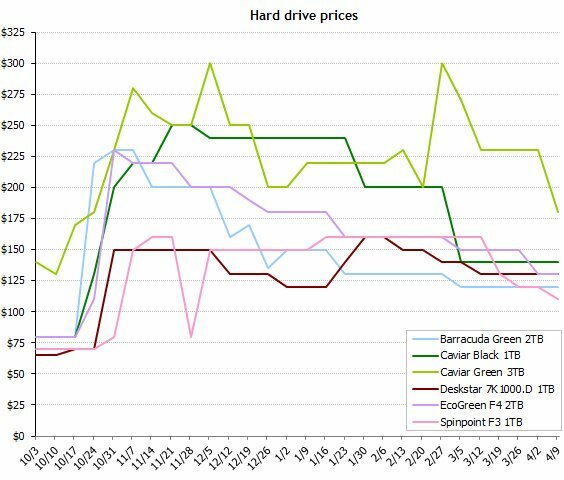 The site compares the pricing of six HDDs since the Thai floods and noticed that prices of three models are currently falling, while pricing of the other three is holding steady. Among the models that are still in stock, prices have fallen or held steady. One of the biggest discounts has come to the Western Digital Caviar Green 3TB, which cost $230 at the beginning of March but runs just $180 today. Our favorite desktop drive, the Samsung Spinpoint F3 1TB, has dropped from $160 to only $110. Samsung's EcoGreen F4 2TB also costs less now than it did in early March, although the difference there is only 20 bucks. While those cuts are encouraging, the terabyte Caviar Black and Deskstar 7K1000.D haven't budged. The graph plainly illustrates that we're still well shy of pre-flood pricing, too. The Spinpoint F3 1TB was selling for $60 around this time last year, or a little more than half what it costs now.